First, let me thank my dad and step mom for hooking us up with an awesome Christmas Gift! The Riverhouse Hotel in Bend was awesomely cool on these scorching hot days, and our dog was most welcome there! Thank you! My alarm clock woke my wife Monica, our dog Chewy and I up at 1:45 am on this Saturday morning, and by 2:15 we were in the car, and on our way to Bend for the weekend. I have many a hiking book thanks to other family members, and Monica found a nice short hike on our route the night before that was about 2 hours away called Iron Mountain. She thought it would be perfect for a quick little sunrise stop, and boy was she right! There was a haze across the valleys, but it didn’t obstruct the view of several Mountains, and the guide at the top helps us easily identify each peak. The shot below was the first shot I took right as I reached the top. 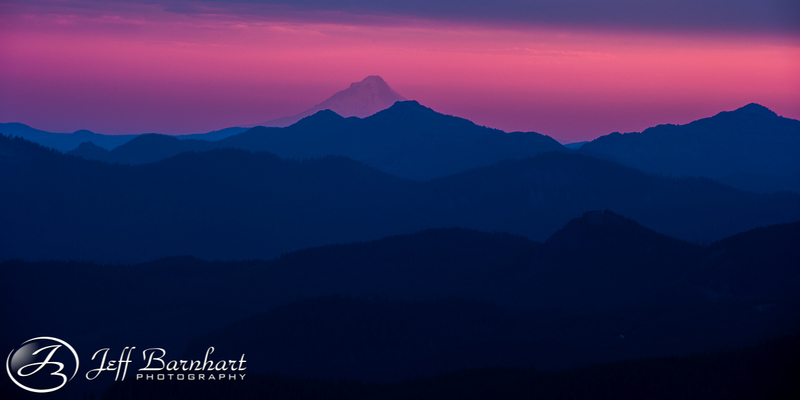 I had to scramble to setup my gear as this hot pink glow from the sun would quickly disappear! In the center you can see Mt. Jefferson, and off to the left is Mt. Hood in the distance. 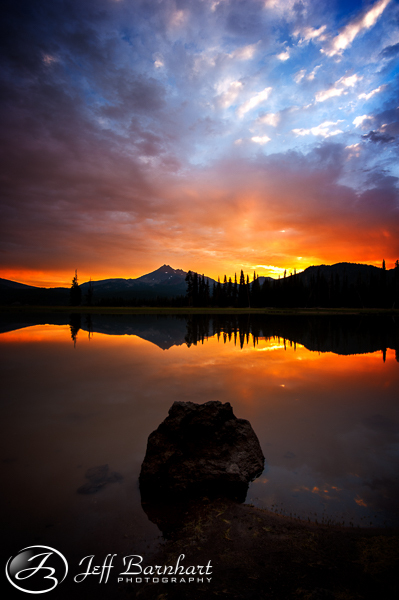 Below is a picture of Mt. Hood, zoomed in from the same spot. 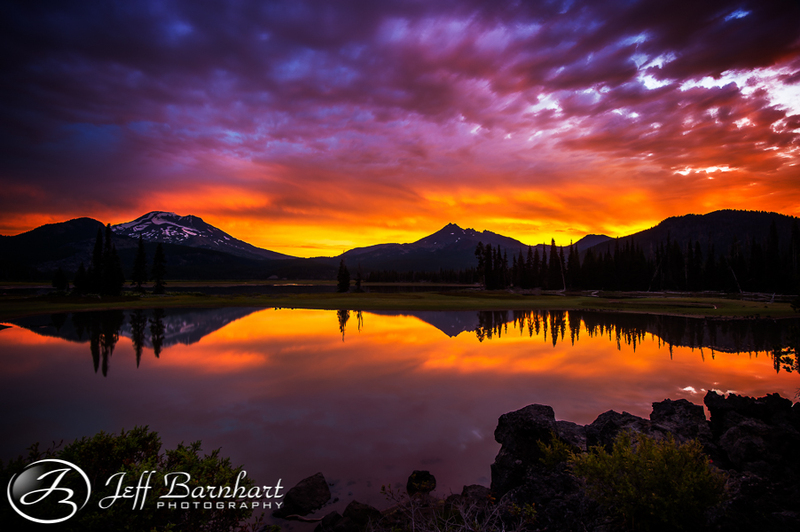 If you’d like to see more photos of this area, just check them out on my Instagram page (@jeffbarnhartphotography). Once magic hour was over, we headed back down to continue our journey. We actually wanted to see more of this area, but I was feeling a little dehydrated and I was out of water, so the extra 2 miles round trip sounded like a bad idea. Our next stop was Big Lake for a little swim… well, not for us, but for Chewy. After 30 minutes of swimming we hopped back in the car and continued on our way, stopping off in Sisters for some coffee and a walk in the park. As we approached Bend, it was still only about 10:30 am, and check-in time was 4:00 pm, so we had some serious time to kill. Monica found that Tumalo Falls was near, so we took the Tumalo Falls State Park exit to check it out. Making the same mistake I’m assuming every tourist makes, we parked, got out and read the sign that said Tumalo Falls isn’t here, so we took the map, got back in the car and followed the map to the trailhead. About 7 miles away from the trailhead there was a sign that said the road to Tumalo Falls was closed, but since we had the time we decided to see if there was a way around. Well, the road was closed, but the good news for anyone that was set on seeing it, there was an alternate route available for those who were willing to hike 14 miles round trip. Not wanting to spend the rest of our day hiking with little water, we opted to find a different hike, and Todd Lake was it. After a nice little hike around Todd Lake we got down to serious business and checked into our hotel and took a nap for a few hours. 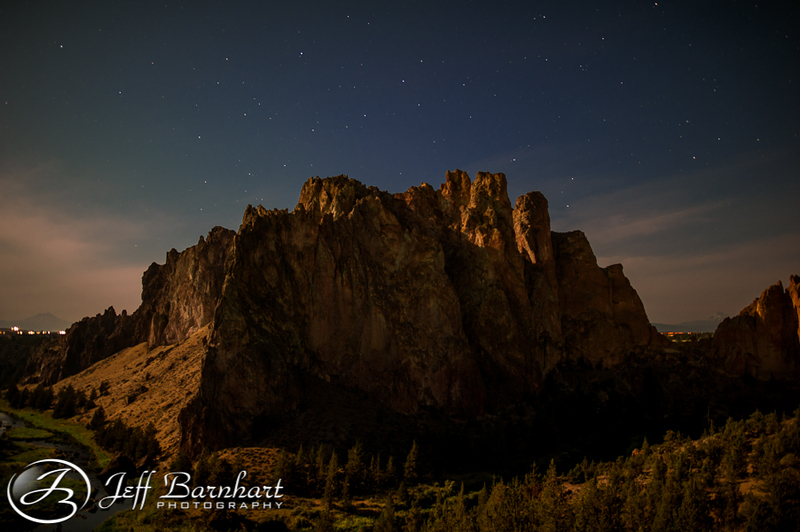 I set my alarm for 6:00 pm, which gave us plenty of time to eat, and then drive to Smith Rock State Park. Smith Rock was a much larger park than I had imagined, with plenty of hiking trails to explorer. 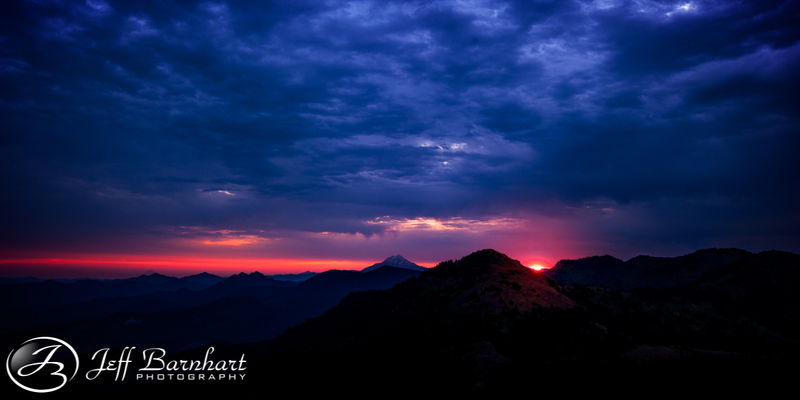 With the late arrival we opted to stay around the rim, shoot sunset, and then a few night shots. Night photography has always been a passion for me, and I was super excited to test some new gear! 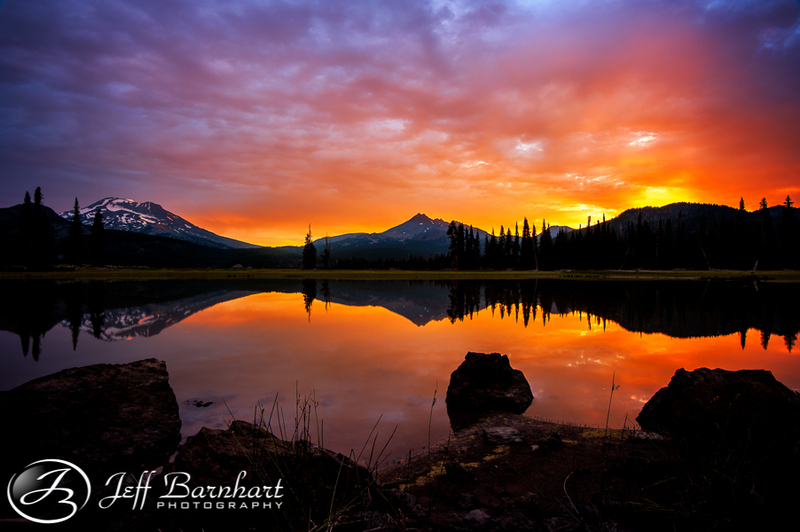 After a good night sleep of about 4 ½ hours I woke up exuberated to shoot Sparks Lake. This was a little vacation for us, so I told my wife to sleep in with Chewy and I’d bring her coffee on my way back. The conditions looked absolutely perfect, and my heart raced as I approached the lake. 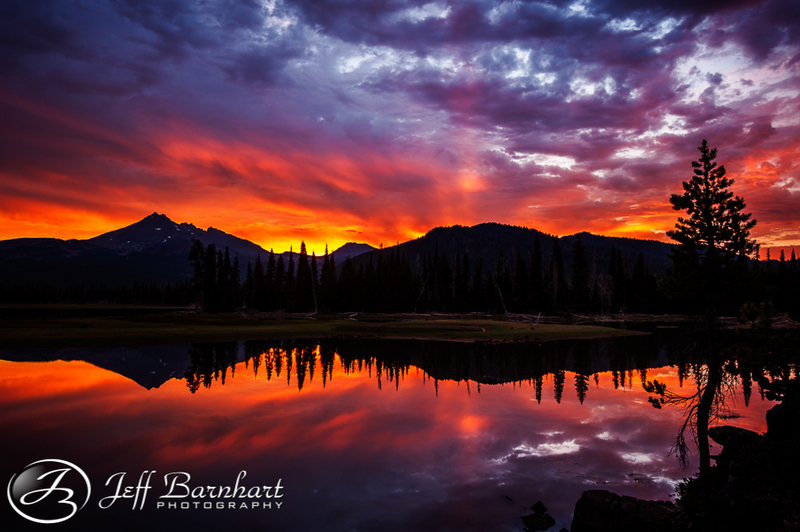 I was curious if I’d even see anyone there, as there was another solar flare that hit this night, so I’d assumed that every photographer in the area would be there attempting to emulate what they had seen from some talented photographers earlier in the week from that very spot. When I arrived I had the whole place to myself, until an older man and his son arrived, just in time to see some of the best light I’d ever seen! This was just the beginning! I scrambled across the bedrock to capture as many compositions as I could! Oh, how I’ve longed for light this good! After the show I packed up and walked back to my car, and drove back to the hotel, stopping off to get coffee on my way. The AC was so delightful here that I told Monica that we should stay until they physically removed us from the building. After a short nap we packed up and headed home, stopping off to check out the Tamolitch Pool before completing our Journey. It’s a beautiful little hike, and from the looks of it an exhilarating swim!